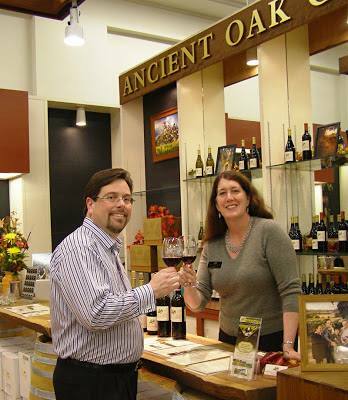 The Rotary Club of Santa Rosa’s member Keven Brown, owner of Corrick’s Stationery & Gifts, and Ancient Oak Cellars hosted club’s social at the first tasting room in the recent history of downtown Santa Rosa. Dozens of Rotarians and guests shared Rotary’s traditional fellowship, Ancient Oak Cellars’ chardonnay and several pinot noirs poured by co-owner Melissa Moholt-Siebert and her tasting room staff, and several tables loaded with fresh fruit, sandwiches and desserts Thursday evening, Feb. 28th. Everyone had a great time. Here are some pictures from this event. I wish I could have gone to this wonderful event, yet I had another engagement. I love this store and now it has a wine tasting bar!